The first year we lived in this house, the year Ursula was born, Jim suggested that we celebrate our first Christmas as a family by cutting our own tree. He got directions to Uncle Tim’s Christmas Tree Farm in Canaan, one hill and four back-road miles from our house. “Uncle Tim” was Tim Lucia, a former commercial pilot who’d cleared several hilly acres of his family’s former farm and planted the sandy soil in balsam, Fraser fir, and Scotch pine. That first year, we made a couple of wrong turns on our way to the farm, and I wasn’t in the best of holiday spirits when we turned at a hand-painted sign and picked our way up a rutted logging road to Uncle Tim’s. We bumped to a stop next to a small fire tended by Tim and his wife, LeeAnn. He handed us a bow saw and gestured to the rolling land that had once pastured livestock and was now planted in rows of trees. Look around, he told us. Take your time. I carried Ursula in a front-pack. She bounced with pleasure as we crunched through the snow, her mittened hands holding onto mine, past trees with soft, long needles (scotch pine) and trees with short, thick needles (Fraser fir and balsam). We took our time, but eventually we chose one, and Jim crawled under the overhanging branches with the saw. Ursula and I breathed in the sweet, strong, herbal smell of fresh-cut balsam. That began our tradition. 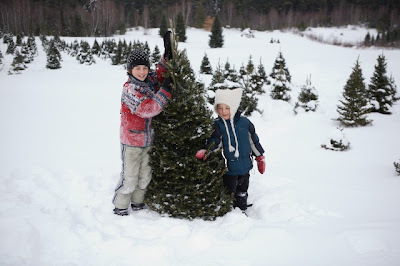 Nearly every year since then, we’ve cut our Christmas tree together on that scrappy hill farm. When Ursula was one, LeeAnn Lucia was newly widowed, and her friends and family sat with her by the fire. We thought she might close the farm after that, but the sign went up the following year, and we kept going. Soon Ursula walked alongside us and crawled under the tree to take her turn with the saw. After Virgil was born, there were a few years where the girls upheld the family tradition, tromping through the snow and cutting down the tree, while the boys napped in the car. Each time, we waited until we had snow on the ground. Each time, we lingered, enjoying views of Mt. Cardigan on clear days and the sting of snow and wind on our faces on other days. Always, we took our time. Two years ago, LeeAnn Lucia remarried and sold Uncle Tim’s. The new owners wanted to keep the tree farm going. They wrote letters to community organizations in Canaan, and a scout troop volunteered to take on the farm as a special project. The teenage boys and girls in the coed troop prune the trees, mow the grass between the rows, and plant seedlings. Last year, they walked the farm with a forester, who recommended that they replant with a new variety called a Canaan fir. They thought it was cool that the variety shares a name with their town. The first snowstorm this year came through on Saturday night and left a couple of inches of snow on the ground. Sunday started out crisp and clear: perfect Christmas-tree conditions. We made a few wrong turns on the way — it’s now part of the tradition — and bumped into a parking spot next to a circle of teenagers standing around a small fire. Virgil joined us for fifteen minutes of looking and then joined the scouts in the fire’s glow while Ursula and Jim and I continued to walk the rows. The idea of Christmas rituals is as old as the holiday, which is itself built on earlier celebrations of the winter solstice. The act of cutting down our Christmas tree every year is ritual writ small, a gradual layering of idiosyncratic details that’s meaningful only to us. On Saturday, I watched with a full heart as Ursula and Jim dragged this year’s tree, another balsam, across the snow to where Virgil and I waited. I know that traditions take time to form. We’ve taken our time over these past twelve years. At some point, our annual trip has turned into a tradition. Use the Brooklyn Botanic Garden’s simple guide to identify common Christmas tree varieties.